The Shop Around the Corner is a 1940 American romantic comedy film produced and directed by Ernst Lubitsch and starring Margaret Sullavan, James Stewart and Frank Morgan. The screenplay was written by Samson Raphaelson based on the 1937 Hungarian play Parfumerie by Miklós László. Eschewing regional politics in the years leading up to World War II, the film is about two employees at a leathergoods shop in Budapest who can barely stand each other, not realizing they are falling in love as anonymous correspondents through their letters. The Shop Around the Corner is ranked #28 on AFI's 100 Years... 100 Passions, and is listed in Time's All-Time 100 Movies. In 1999, the film was selected for preservation in the United States National Film Registry by the Library of Congress as being "culturally, historically, or aesthetically significant." The supporting cast included Joseph Schildkraut, Sara Haden, Felix Bressart, and William Tracy. Alfred Kralik (James Stewart) is the top salesman at a leathergoods shop in Budapest owned by the high-strung Mr. Hugo Matuschek (Frank Morgan). Kralik's coworkers at Matuschek and Company include his friend, Pirovitch (Felix Bressart), a kindly family man; Ferencz Vadas (Joseph Schildkraut), a two-faced womanizer; and Pepi Katona (William Tracy), an ambitious, precocious delivery boy. One morning, Kralik reveals to Pirovitch that he's been corresponding anonymously with an intelligent and cultured woman whose ad he came across in the newspaper. Kralik is Mr. Matuschek's oldest and most trusted employee—just invited to a dinner party at Matuschek's home—but lately there has been tension between the two. They get into an argument over Mr. Matuschek's idea to sell a cigarette box that plays "Ochi Chërnye" when opened. Kralik thinks that it is a bad idea. Although annoyed with Kralik's stubbornness, Matuschek is reluctant to ignore his judgment. After their exchange, Klara Novak (Margaret Sullavan) enters the gift shop looking for a job. Kralik tells her there are no openings, but when she is able to sell one of the cigarette boxes (as a candy box), Mr. Matuschek hires her. As Christmas approaches, Kralik is preparing to finally meet his mystery correspondent for a dinner date. Planning to propose if the date works out, Kralik requests a raise from Mr. Matuschek, who has not been in a good mood for months. Forced to put up with the pesky Miss Novak—the two simply cannot get along—Kralik is grateful that his anonymous correspondent is nothing like her. He admits to Pirovitch that he is nervous about meeting this "most wonderful girl in the world" for the first time. Kralik's planned meeting is frustrated when Mr. Matuschek demands that everyone stay after work. He and Kralik argue when Kralik mentions his previous engagement. Later Kralik is called into Mr. Matuschek's office—and is fired. No one in the shop understands Mr. Matuschek's actions; they do not know that Mr. Matuschek suspects Kralik of having an affair with his wife. Later, Mr. Matuschek meets with a private investigator who informs him that his suspicions were correct, that his wife is having an affair with one of his employees—Ferencz Vadas. Pepi returns to the shop just in time to prevent the distraught Mr. Matuschek from committing suicide. Meanwhile, Kralik arrives at the Cafe Nizza, where he discovers that his mystery woman, with the red carnation as planned, is in fact Klara Novak. Despite his disappointment, Kralik goes in and talks with her, pretending he is there to meet Pirovitch. In his mind, Kralik tries to reconcile the cultured woman of his letters with his annoying coworker—secretly hoping that things might work out with her. But concerned that Kralik's presence will spoil her first meeting with her "far superior" mystery correspondent, she calls Kralik a "little insignificant clerk" and asks him to leave, and he does. Later that night, Kralik goes to the hospital to visit Mr. Matuschek, physically uninjured after his suicide attempt, but recovering from a nervous breakdown. 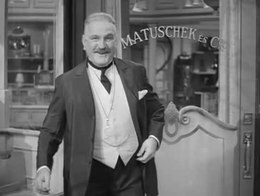 After apologizing for his behavior, Mr. Matuschek offers him a job as manager of Matuschek and Company, gives him the keys to the shop, and asks him to dismiss Vadas quietly. Kralik dismisses Vadas, loudly and publicly, pushing Vadas across the shop floor into a pile of cigarette boxes. Grateful to Pepi for saving his life, Mr. Matuschek promotes the errand boy to clerk. The next day, Miss Novak calls in sick after her mystery man failed to show. That night, Kralik visits her at her apartment, where she reveals her problem to be "psychological". During his visit, she receives a letter from her correspondent and reads it in front of Kralik (who wrote the letter). Two weeks later, on Christmas Eve, Matuschek and Company achieves record sales. A grateful Mr. Matuschek gives everyone their bonuses and sends them home early. Feeling lonely, he tries to get someone to have dinner with him, but most of his employees have other plans. Then Rudy, the new errand boy who lives alone in the city, gratefully agrees, and he and Matuschek go out on the town. Kralik and Miss Novak, now alone in the shop, talk about their planned dates for the evening and Miss Novak reveals that she had a crush on Kralik when they first met, back when she was "foolish and naive". After pretending to have met Miss Novak's mystery man—whom he claims is overweight, balding, and unemployed—Kralik puts a red carnation in his lapel and finally reveals to Miss Novak that he is in fact her mystery correspondent—her "dear friend"—and they kiss. The Shop Around the Corner has a 100% rating on Rotten Tomatoes, with the critical consensus stated as, "Deftly directed by Ernst Lubitsch from a smart, funny script by Samson Raphaelson, The Shop Around the Corner is a romantic comedy in the finest sense of the term." Dave Kehr argued Lubitsch makes "brilliant deployment of point of view, allowing the audience to enter the perceptions of each character at exactly the right moment to develop maximum sympathy and suspense." It ranked 202nd in the British Film Institute's 2012 Sight & Sound critics' poll of the greatest films ever made, having garnered eight critics' votes. The work was also 58th in BBC's 2015 poll of the best American films. Among the greatest of all films. This is a love story about a couple too much in love with love to fall tidily into one another's arms. Though it all works out finally, a mystery is left, plus the fear of how easily good people can miss their chances. ...[The movie] is a treasury of hopes and anxieties based in the desperate faces of Stewart and Sullavan. It is a comedy so good it frightens us for them. The café conversation may be the best meeting in American film. The shot of Sullavan's gloved hand, and then her ruined face, searching an empty mail box for a letter is one of the most fragile moments in film. For an instant, the ravishing Sullavan looks old and ill, touched by loss. The Shop Around the Corner was dramatized in two half-hour broadcasts of The Screen Guild Theater, first on September 29, 1940, with Margaret Sullavan and James Stewart, second on February 26, 1945, with Van Johnson and Phyllis Thaxter. It was also dramatized as a one-hour program on Lux Radio Theater's June 23, 1941 broadcast with Claudette Colbert and Don Ameche. The film spawned a musical remake, In the Good Old Summertime (1949), which stars Judy Garland and Van Johnson. The 1963 Broadway musical She Loves Me was also inspired by the play and the film. The film You've Got Mail (1998), with Tom Hanks and Meg Ryan, revolves around two people who dislike each other while developing an anonymous romance by email correspondence. The film uses plot elements and dialogue lines similar to the 1940 film, especially during the first date. Screen credit of You've Got Mail is given to Miklós László for Parfumerie (i.e. the play, on which the 1940 film is based), but in a nod to the earlier film, one of the protagonists of You've Got Mail owns a bookstore named "The Shop Around The Corner". ^ In the musical remake In the Good Old Summertime, an uncredited Charles Smith is one of the quartet singing with Judy Garland at the engagement party. ^ "The Shop Around the Corner (1940) - Articles - TCM.com". Turner Classic Movies. ^ a b "The Shop Around the Corner". Internet Movie Database. Retrieved March 23, 2012. ^ Corliss, Richard; Schickel, Richard (February 12, 2005). "All-Time 100 Movies". Time Inc. Retrieved March 23, 2012. ^ "Films Selected to The National Film Registry, 1989-2010". Library of Congress. Retrieved March 23, 2012. ^ a b "Full cast and crew for The Shop Around the Corner". Internet Movie Database. Retrieved March 23, 2012. ^ "The Shop Around the Corner (1940)". Rotten Tomatoes. Retrieved January 30, 2017. ^ Kehr, Dave. "The Shop Around the Corner". Chicago Reader. Retrieved January 30, 2017. ^ "Votes for The Shop around the Corner (1940)". British Film Institute. Retrieved January 30, 2017. ^ "The 100 greatest American films". BBC. July 20, 2015. Retrieved February 21, 2017. ^ "Those Were The Days". Nostalgia Digest. 41 (3): 32-39. Summer 2015. Wikimedia Commons has media related to The Shop Around the Corner.